So do all the lessons of winning at games apply to real life? No, they do not. But only a fool would walk away from competitive games without learning a wealth of life lessons. Games require training, practice, and discipline. Having a love for what you’re doing really does help you. Games teach you to remain calm under the most dire of circumstances, and to never give up until your very last breath of life is spent. They teach you to learn from your mistakes, rather than shift the blame to others, because that is the only real way to improve. They teach that continuous self-improvement over time is the only way to survive. Competitive games are a means of expression as well. Players seem to have trouble approaching a game differently than they approach life in general. The way they take in information, the way they make decisions, the aspects they value, and the skills they excel at are usually similar inside and outside of the game. In fact, many people, myself included, have come to understand a lot more about who they really are through the way they end up expressing themselves in games. There are many forms of expression in the world, but one of the advantages of competitive games is that they force you to test your worldview against the worldviews of others. It’s easy to develop highly unpopular theories about life in general that you have no real way of testing, but competitive games force you to jump in, get dirty, and see how those ideas really stack up. If you are an unconventional genius, you will prove so beyond all doubt. If you are a confused quack, that too will be borne out, and you will have the opportunity to learn from others and change your ways. Furthermore, competitive games teach you to focus on results. You can define yourself to be a great player, but the community will define winners in terms of their ability to win. They care about results, and you should too. Everyone “could be” the best player if only they practiced more, if only they had the chance to play more, if only this or that. But none of that really matters when the gold medal is handed out. The gold medal goes to the person who gets the job done. That is great lesson for anyone who is involved in any business endeavor at all. The grand, unfinished product or project is of little value compared to the one that demonstrates results. The brilliant, half-finished book is of little value compared to the published one. The daydreams of a better life are not as valuable as getting out there and effecting real change in your life, and getting results. So the application of Playing to Win to real life is not a simple, direct relationship. It may require some wisdom on your part to know which aspects of games are diametrically opposed to real life, and which ones are not. Those are decisions you’ll have to make for yourself. 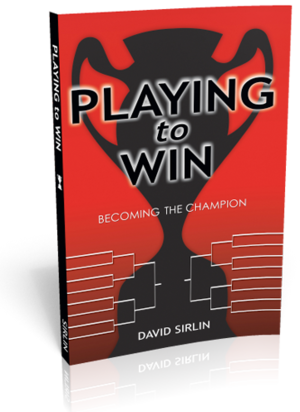 Should you choose to truly Play to Win, though, I would expect your path to be as difficult and fulfilling as almost any other worthwhile personal journey you might undertake. Happy gaming, and make your own luck.